Loom bracelets are lovely. But I think they are even more so if you add them to metal channel cuffs! Just check out Estelle of Petit Bout de Chou's tutorial for a really pretty design. This Hong Kong based designer also has an Etsy store where she sells these cuffs too. 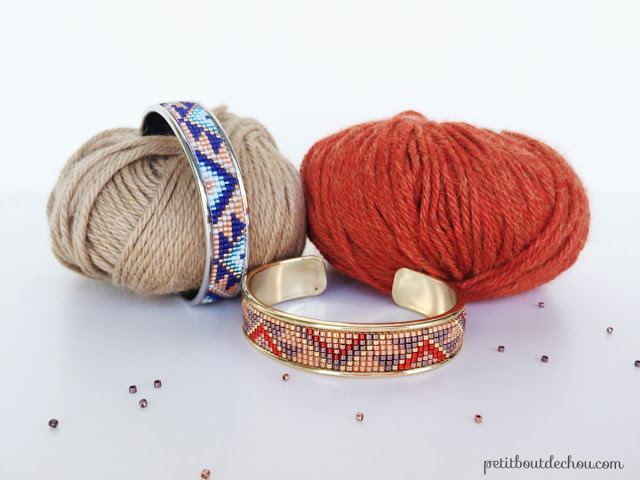 Her tutorial covers how to make a loom bracelet and how to glue them onto the cuffs. I agree with Estelle. Really even beads like Miyuki work best for loom work. You can get different widths of channel bangles. I like those from Nunn Design like this round copper one because they are also available in different metal colors. Wow - what can't be done with those channel findings?! These are lovely. I can imagine them in all designs and colourways...simply a great idea.